God has no ugly children! 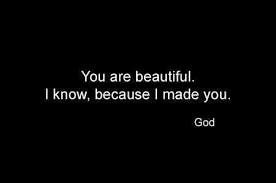 God made you good looking! It is not what people say about you that is important, but what God says about you. 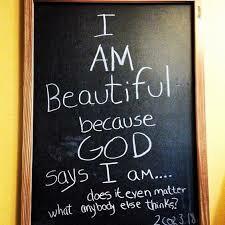 God says you are a priceless, unique, creation; beautiful in His sight. People may have used, abused, and mistreated you, but God never will. 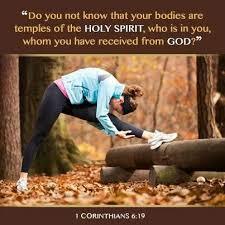 Well, when you invited Jesus into your heart, God Himself came in, and now, your body is literally a place where God lives! Ps 84:1 How amiable are thy tabernacles, O LORD of hosts! 1-2 What a beautiful home, God-of-the-Angel-Armies! I’ve always longed to live in a place like this, Always dreamed of a room in your house, where I could sing for joy to God-alive! 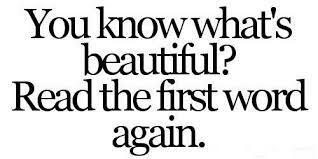 You are now God’s beautiful home! Well, when you sum up these verses, and all the translations, this is what is critical to you. is this: God, by His Spirit came to live inside of you. Because God lives in you, you are lovely, beloved, a beautiful home, greatly loved, a beautiful dwelling place of the Most High God. Oh! That we would learn to place God’s word above that of all others!